Wasps in your domestic or commerical property can be very worrying, possibly causing injury or damage to your property. Call professional help from S.W.A.T.Pest Control Lincolnshire. Have you found a wasp nest? Are you worried about wasps? The following information will help you. If you have spotted lots of wasps and you are worried about getting stung, please find below some useful information all about Britain's most annoying garden pest. Queen wasps emerge and start working on new nests in the spring, as the weather gets warmer. During the summer months, wasp nests are working to full capacity, with up to 200 to 300 eggs being produced every day and up to 5,000 to 8,000 adults feeding grubs and building the nest. In the UK you are most likely to come across the common wasp (Vespula vulgaris) and German Wasps (Vespula Germanica). Both species are yellow and black striped and have painful stings that can cause allergic reactions. One of Britain's most feared and potentially aggressive pests, wasps are known for their nasty stings and random attacks. Wasps will usually only attack if they feel threatened. The problem is a wasp in distress emits a pheromone that is sent to the nearby colony, causing its fellow members to go into a defensive, stinging frenzy. Wasp stings are at best painful, and at worst fatal. If you are sensitive to wasp stings then they can send you into anaphylaxis shock a severe, potentially life-threatening allergic reaction. Children, elderly people, those with allergies, and household pets are particularly sensitive to wasp stings. If you are worried about a large amount of wasp activity around your home, you should contact S.W.A.T. Pest Control for advice, our technicians can safely deal with the problem in a professional manner. After a sting, if you have difficulties like breathing, dizziness or a swollen face - you need to seek immediate medical treatment. If you have not had a severe allergic reaction, your sting will still be very painful. Avoid scratching and do not try any home remedies. Vinegar and bicarbonate of soda are just going to make it worse. 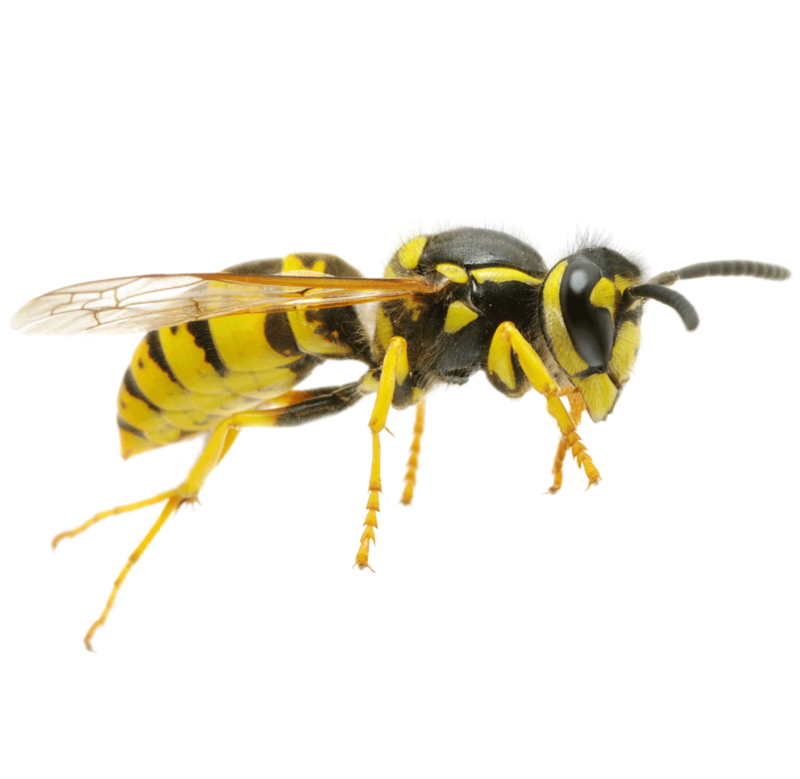 If you own business premises, you need to take wasp pest control seriously. Wasps in your premises can be more than a nuisance. If your customers experience a high level of wasp activity, then they are likely to complain and request a refund or leave a negative review. Either could result in a loss of future income. After all, you have a duty to protect your customers and staff. To minimise the disruption to your business, we suggest you contact S.W.A.T. Pest Control. Should all wasp nests be treated? No. Wasps should only be treated if they pose a risk to public health and safety. Wasps can be beneficial in gardens as they feed their grubs on caterpillars and other insects, thereby reducing these pest populations. If you are seeing a large number of wasps in and around your home or work, there is probably a wasp nest nearby. Wasp nests come in many different shapes and sizes. They are amazing pieces of architecture that can contain up to 8,000 wasps during peak activity in late summer. They build their nest using chewed wood and saliva to make a papier-mache material. The nest material is durable, lightweight and surprisingly waterproof. This is by no means an exhaustive list. Swat technicians have treated nests in everything from rolled up carpets to axles on tractors. To work out where your wasp nest is, look for high activity in one area in particular around your property. In early spring, you might encounter a wasp nest the size of a golf ball. This would suggest it contains only the solitary queen wasp and maybe a few workers. As the summer goes on, a wasp nest can contain thousands of wasps and easily get to the size of a football, if left to grow. The earlier you treat a wasp nest, the less aggressive the colony is going to be. Call S.W.A.T. Pest Control to get them to removed safely. Wasps can be confused with Hornets, Hornets are rare in the UK, but if you do see one, it's likely to be the European hornet. Wasps are classified under the order Hymenoptera, which means "membraneous wings". All the stinging insects belong to this group, and they are a highly evolved group of insects. All wasps have complex social structures and different ways of doing things. Both common and German wasps are large, conspicuous buzzing insects with yellow and black striped, wasp-waisted bodies. They have a sweet-tooth at one end and a painful sting at the other! The queen wasp is larger than normal wasps (about 20mm). She hibernates over winter, making a nest in the spring in which to lay her eggs. She feeds the grubs on insects until they develop into worker wasps, three to four weeks later. Workers, all sterile females, forage for over a mile in search of food. At the end of the year when the colder air arrives, and fruit starts to perish quickly, wasps start to starve or die of the cold. 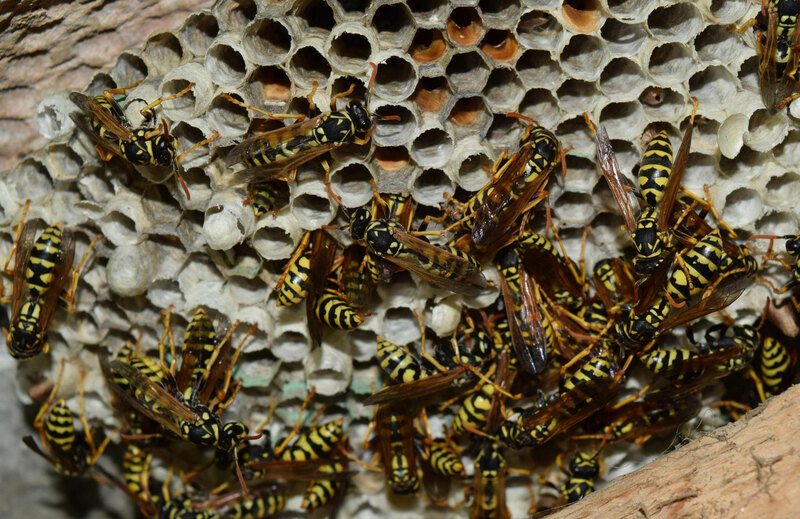 The adult worker wasps start to die off, and the new queen wasps go into hibernation and emerge in the spring to initiate the process again, building completely brand-new nests. One nest may produce 3,000-8,000 wasps in a year on average. Wasps are natural pest controllers and tend to eat other insects. At their peak in August and September with the youngsters reared, the workers turn to the sweet food they prefer and become a nuisance. Wash around the sting with soap and water. Apply a cold compress, like an ice pack, for at least 10 minutes. Elevate the affected area, if possible. In your shed or garage. You are just one click away from getting the professional pest control assistance you need. Prevention is always better than cure. There are things you can do to stop wasps invading your home or business. Simply keeping your home secure will stop wasps wandering into the house. Standard fly screens can help stop wasps getting in while remaining cool in the hotter months. Open bins will attract greedy wasps looking for a cheap, sweet meal. Keep your bins away from the house and make sure the lid is on properly. You can check all the most likely areas, each spring when the nests are tiny and easy to deal with. They will be about the size of a golf ball. Check the loft, garage, shed and under eaves. When wasps are causing a nuisance or endangering human health, we may have to destroy a wasp nest. Treating a wasp nest can be very dangerous. Wasps inside the nest will feel threatened and often become aggressive. This could cause them to sting you and others as they defend their nest resulting in multiple stings, wasps do not die after one sting, they can, and will, sting you quite a few times! Remember, not every wasp nest needs destroying - so if it's well away from a building in a rarely used part of the garden, you might want to just leave it alone. Wasps abandon their nests after the summer and won't return to it the following year. To get rid of wasps you don't need to remove the nest, but you may need to treat it. To keep yourself and your family safe, we would always recommend S.W.A.T. 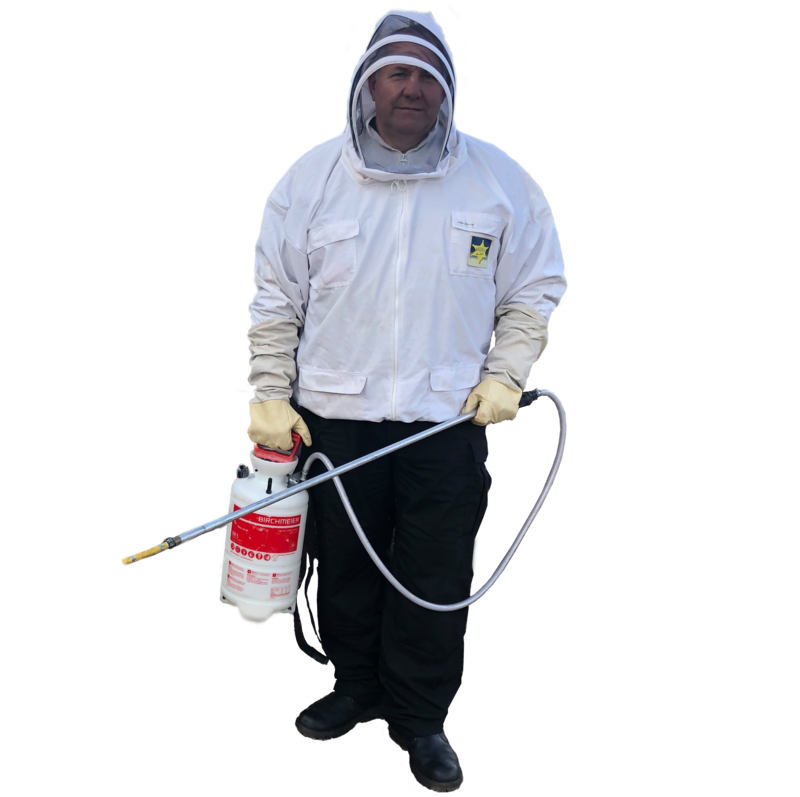 Pest Control, your local pest controller, they have the technical knowledge and access to a range of professional insecticides which are not available to the public. They will also have the appropriate protective equipment to avoid getting a nasty sting. S.W.A.T. Pest Control will apply an insecticide near the entrance of the nest. The wasps then bring the chemical into the nest. After a couple of days, the wasps will die from the dose of the pesticide. Even if you think your wasp nest is at an inaccessible height, S.W.A.T. Pest Control will have the equipment to reach and treat the nest in the safe and professional manner. You can ask your technician to come and remove the nest after a few days, but this will incur a small extra charge. Alternatively, you can wait until the autumn or winter when you are certain no live wasps remain and remove the nest yourself. If the nest has been treated with a pesticide we suggest you wear protective clothing and gloves. Although an insect spray will quickly kill any wasps you hit in flight, the sheer number of wasps per-nest means this is a waste of time. You will see all sorts of DIY nest removal guides online. They are all very dangerous and not recommended by us. When wasps feel threatened they release a chemical to call for help. While being stung by one wasp isn't normally dangerous, 30 or 40 stings could kill you. DIY products can be effective for dealing with small nests in the early spring, however, they are unlikely to help with a large, established nest. Professional pest controllers have access to professional use products. NEVER attempt to deal with a wasp nest if you think you might be allergic to stings. Content © Swat Pest Control All rights reserved.